A wilderness filled with dangers waiting around every bend. A Virginian surveyor intent on helping to colonize the land of Kentucke. An innkeeper’s daughter wanting the surveying party gone before her secret is revealed. When Tempe Tucker is asked to guide the surveying party through Kentucke she initially declines. However, she soon changes her mind. The group heads into the woods and it does not take Sion Morgan long to realize there is more to Tempest than meets the eye. The thing is, Tempe is not the only one keeping a secret. This story sucked me right in and held me tight. I inhaled it. The descriptions of wilderness life in 1777, the characters and their personalities. I felt as though I was part of the surveying group. The story is filled with riches in history mixed beautifully with fiction. I happily recommend this book to anyone who is a fan not only of Laura Frantz but also of settlement stories, history, and/or adventures. From beginning to end it was well-written. And may I add, I love that Tempe was portrayed as a GUIDE for the surveying party! She also was part of their night security watch. In an era when that would have been frowned upon more than accepted. Wifi is back on here and I can now catch up with my blog. Every now and then wifi cuts out and I cannot update my blog as I wish to, sorry about that. But I will post for the days I missed. Occasionally I lose the internet connection so I hope you can forgive my tardiness. Anywho, I have started a new book for review and it has yanked me in! In fact, it has not only yanked me in, it has pulled me back to 1777 Kentucke (as Kentucky was spelled back then). The wilderness, the home living, the unrest, surveying for new livable land, the variety of characters, the descriptions…. It is a beautiful story. By now you are probably wondering what book exactly I am talking about. 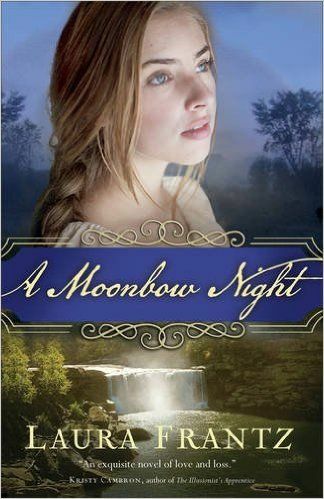 It is Laura Frantz’s new novel, A Moonbow Night. I am looking forward to telling you more about it in my review, which I will be posting tomorrow (it is part of a blog tour which is why I am posting it early this week). What are you reading currently? I would love to hear about it.